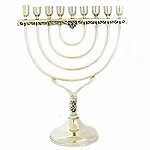 A round shape Sterling Silver Menorah. Talit sizes 24, 45, 50, 60, 70 or 80 inch will incur additional charges. Your shopping basket will not SHOW this, but the correct amount will be added to your invoice. Embroidered Talit Wool Talit, comes with a matching Talit bag.